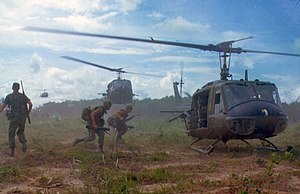 In the Vietnam War U.S. soldiers often used helicopters to go into battle. changes Unification of North and South Vietnam into the Socialist Republic of Vietnam. The Vietnam War (also known as Second Indochina War or American War in Southeast Asia) lasted from 1955 to 1975. It was fought between North Vietnam and South Vietnam. North Vietnam was supported by the USSR, China and North Korea, while South Vietnam was supported by the United States with its allies, Thailand, Australia, New Zealand, and the Philippines. This conflict between pro-communist and pro-capitalist countries was part of the Cold War. The Viet Cong (also known as the National Liberation Front, or NLF), was a South Vietnamese communist force helped by the North. It fought a guerrilla war against the anti-communist forces in the South. The People's Army of Vietnam (also known as the North Vietnamese Army) engaged in a more conventional war, at times committing large units to battle. Viet Minh wave their flag over a captured French bunker at Dien Bien Phu in 1954. The French defeat at Dien Bien Phu in the northern part of Vietnam led the Geneva Conference and the resulting partition of Vietnam into north and south at the 17th Parallel. Hanoi was the capital of the Democratic Republic of Vietnam (North) and Saigon was the capital of the Republic of Vietnam (South). Map of a partitioned Vietnam from a 1964 U.S. Government pamphlet. Communist-controlled North Vietnam is in red; almost all of the ground-fighting was in the non-communist South. France began to colonize Vietnam between 1859 and 1862, when they took control of Saigon. By 1864 they controlled all of Cochinchina, the southern part of Vietnam. France next took control of Annam, the large central part of Vietnam, in 1874; and then Tonkin, the northern part of Vietnam, after its victory over China in the Sino-French war (1884–1885). French Indochina was formed in October 1887 from these three areas of Vietnam, Cochinchina, Annam and Tonkin, as well as the Kingdom of Cambodia, with Laos being added after a war with Thailand (the Franco-Siamese War) in 1893. During World War II, after the Nazi Germany's conquest of France in 1940, French Indochina was controlled by the Vichy French government, a puppet government approved by Nazi Germany. In March 1945 Imperial Japan launched the Second French Indochina Campaign and occupied Indochina until Japan's surrender in August 1945. After the defeat of Nazi Germany the Vichy government was no longer in control of France or its territories. The newly formed Provisional Government of the French Republic attempted to take back control of its former colonies in Indochina by force if necessary. But the French efforts at regaining their colony in Vietnam were opposed by a Vietnamese army called the Viet Minh. The Viet Minh had been founded in 1941 by the communist party and was led by Hồ Chí Minh. This led to the First Indochina War between France and the Viet Minh. The fighting started with the French bombardment of Haiphong Harbor in November 1946 and ended with the disastrous French defeat at Dien Bien Phu. In July 1954, France and the Viet Minh signed the Geneva Peace Accord. This resulted in the partitioning of Vietnam along the 17th parallel into a northern section under the control of the communist led by as president, and a southern section led by the Catholic anti-communist Ngo Dinh Diem. The partition was to be temporary until elections in 1956, however Diem started arresting suspected communist sympathizers in 1956 in a bid in part to keep power for himself, the elections were never held, and in 1957 the north Vietnamese began guerilla warfare against the south. The United States supported the anti-communist government in South Vietnam. It began to send military advisers to help train and support the South Vietnamese army. The South was fighting against the Viet Cong, a communist party based in South Vietnam which was allied with North Vietnam. The Viet Cong began a campaign of assassination in 1957. In 1959, North Vietnam dramatically increased its military assistance to the Viet Cong, which then began attacking South Vietnamese military units. The Americans were afraid of the 'domino theory'. The destroyer USS Maddox. It was alleged that 3 North Vietnamese torpedo boats fired on the Maddox. And two days later in the same area, upon the Maddox and the destroyer USS Turner Joy. This led to the United States Congress passing the Gulf of Tonkin Resolution which gave the U.S. President expanded power to wage war. This promptly led to the escalation of the war in Vietnam. 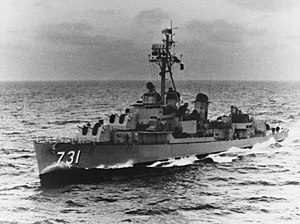 On 2 August 1964, the destroyer USS Maddox, on an intelligence mission along North Vietnam's coast, allegedly fired upon and damaged three Soviet-built North Vietnamese P-4 torpedo boats that fired on it in the Gulf of Tonkin. A second attack was reported two days later on the destroyer USS Turner Joy and the Maddox. In the alleged second attack there was no alleged visual sighting it was all via what was seen on the ship's radar. After the alleged second attack the U.S. launched air strikes against North Vietnam, and Congress passed the Gulf of Tonkin Resolution on 7 August 1964 which gave the president the authority power to conduct large-scale military operations in Southeast Asia without declaring war. There was little to no proof of these attacks and it was belived by some that there were a pretext for expanded U.S. involvment in Indochina. In 2005 an undated National Security Agency (NSA) publication was declassified which stated that there was no attack on 4 August. “Hell, those dumb stupid sailors were just shooting at flying fish." The North Vietnamese and Vietcong were supplied by a vast network of hidden trails, known as the Ho Chi Minh Trail.Supplies and soldiers from North Vietnam were sent through Laos to communists forces in South Vietnam. America subjected the Ho Chi Minh Trail to extremely heavy bombing and three million bombs were dropped on Laos. Severe communist losses during the 1968 Tet Offensive made it possible for the U.S. to withdraw many soldiers, a policy called "Vietnamization." South Vietnamese troops were trained and equipped to replace the Americans who left. By 1973, 95 percent of the American troops were gone. A peace treaty was signed in Paris in January 1973 by all the parties, but fighting continued until 1975. Cross-sectional diagram showing an example of a section of tunnel system used by the Vietcong during the Vietnam War. The area with the largest amount of tunnels was called the Iron Triangle by the Americans. The Viet Minh and later their successors the Vietcong used these tunnels. Some of the larger tunnel complexes had kitchens, operating rooms, dorm rooms, storage rooms and school rooms. A Vietcong soldier wearing typical clothing and sandals in a tunnel. They often ate and slept in these tunnels and would disappear into them when the Americans raided a village. Captured photo showing Vietcong troops traveling in flat-bottomed boats called sampans. US Airborne troops under attack during the Battle of Dak To (1967). There were some large-scale battles during the Vietnam War however most of the fighting was guerilla warfare. The word guerilla is Spanish for 'little war'. This type of warfare is different from the large-scale battles fought between armies, like those in World War II. Guerilla warfare is when small units fight limited battles against an enemy force, set up ambushes, make surprise attacks against the enemies' camps, and then retreat back into the countryside or blend into the local population. It also includes making it difficult for the enemy to operate by engaging in sabotage and harassing the enemy with lethal means such as booby traps. The communist troops more often engaged in guerilla warfare against the South Vietnamese and American troops. Although most traps were non-explosive, there were a few explosive traps which all used grenades. A trip wire was placed and if a soldier tripped over the wire, a grenade pin was pulled out and the grenade would blow, killing the soldier. Another style of trap was nicknamed “Venus Flytrap”. It had about eight barbs attached to a rectangular frame sitting on a small hole. The barbs were facing down so when the soldier’s leg got caught in it, it wouldn’t hurt until he pulled his leg out. When he pulled his leg out the barbs would rip through his leg. Another Vietcong trap was the Punji trap. Two wooden platforms were placed and covered with leaves to camouflage it. There were spikes on the inside of the wood. When a soldier came along and walked on the wood, it caved in and the spikes would go through the soldier’s foot. These traps were the most common because they were the cheapest and very effective. They also were often contaminated so that the soldier would also become infected. Vietmanese refugees fleeing from communist forces, on an American aircraft carrier off the coast of Vietnam on April 29, 1975, the day before the complete fall of Saigon. The Fall of Saigon was the capture of Saigon, the capital of South Vietnam, by the People's Army of Vietnam and the National Liberation Front on April 30, 1975. This marked the end of the Vietnam War and the beginning of the formal reunification of Vietnam into a communist state. Before the city fell the few American civilian and military personnel left in Vietnam, along with tens of thousands of South Vietnamese soldiers and civilians had fled. North Vietnamese forces under the command of the General Văn Tiến Dũng began their final attack on Saigon, which was commanded by General Nguyen Van Toan on April 29, with a heavy artillery bombardment of Tân Sơn Nhứt Airport which killed the last two American servicemen who died in Vietnam, Charles McMahon and Darwin Judge. By the afternoon of the next day, North Vietnamese troops had occupied the important points within the city and raised their flag over the South Vietnamese presidential palace. The government of South Vietnam formally gave up shortly after. Saigon was renamed Ho Chi Minh City, after communist leader Ho Chi Minh. ↑ "Ho Chi Minh Trail". Spartacus Education. Unknown [last update]. http://www.spartacus.schoolnet.co.uk/VNhotrial.htm. Retrieved June 1, 2012. ↑ "Battlefield:Vietnam | Guerrilla Tactics". pbs.org. 2011 [last update]. http://www.pbs.org/battlefieldvietnam/guerrilla/index.html. Retrieved March 13, 2011. ↑ "Booby Traps". Mcdonald College. 2004 [last update]. http://vietnam-warfare.tripod.com/vietnamwarfare/id3.html. Retrieved May 30, 2012. This page was last changed on 9 December 2014, at 01:44.